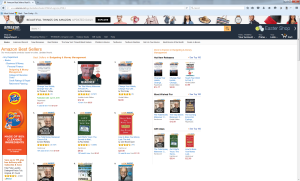 My just released book, Change Your Habits, Change Your Life has hit #1 on Amazon. Thank you Yahoo, who put my book on their front page today. Also, I’m honored to be the official bookend for Dave Ramsey’s book Total Money Makeover. Congratulations on the #1 book status, Tom. Have been with you for about a year and find your journey a fascinating story that has application for everyone. Happy for you my friend! Tks Tim. If I knew how hard it would be to succeed in this author business I’m not sure I would have had the courage to pursue it. Sometimes ignorance is bliss I guess.